80 p. 8.5" x 11" magazine. No longer published. Used copies are sometimes available at Amazon. There are only a handful of magazines on the martial arts worth spending your time or money on these days. 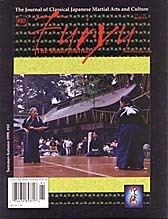 Furyu: The Budo Journal is most emphatically one of them and belongs on your bookshelf. Established in 1994 by Wayne Muromoto, with some serious prodding by author Dave Lowry, the magazine was an attempt to counteract the Black Belt-ization of the martial arts press. Wayne wrote in that first issue (now a collector's item) "Furyu is about elegant, classical time-honored and historical aspects of traditional Japanese martial arts; the kobudo (old martial arts) and the shinbudo (which include kendo, judo, karatedo, aikido, and so on). Regardless of system or style of traditional Japanese budo, we will espouse those martial arts schools, teachers and students that, in our carefully guarded opinion, attempt to foster certain attributes in a student. These characteristics include respect, honor, propriety and humbleness. Whether the art emphasizes kobudo or shinbudo, sportive or pure kata, we will try to be a forum for knowledgeable dialogue on all forms of 'traditional' Japanese budo." Four years and nine issues later (the initial bimonthly publication schedule proved to be a little too ambitious--subscriptions are now for six issues, not necessarily for one year) Furyu has maintained a high level of integrity of content. In fact, the only thing truly lacking in this magazine, which appeals to modern budoka and classical purists alike, is a predictable publication schedule. Read an excerpt: "Takeuchi Hisayoshi, The Little Warrior" by Wayne Muromoto. ©1998 Diane Skoss. All rights reserved. This review is a Koryu.com original.